Tonight Doyle Davidson shares how he has continued for years to preach the gospel; the death, burial, and resurrection of the Lord Jesus Christ out of this ministry, and it has always been with the power of God; never wavering either as the power of darkness came upon the ministry in 2004 just as the Lord had warned him it would. 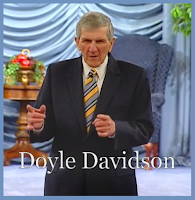 Doyle shares how people falsely accused him, rejected him, and began leaving the ministry, but he has continued standing in the gap for every person, those who have willfully sinned, interceding before God, that their judgement be held back even through to the point of the weeks of the harvest; not looking for any thanks, but simply doing what is his duty to do. Kathie Davidson preaching the gospel, and ministering how God inhabits our praises.